I got an order mixed lots of faceted stones from a gemstone company, and I never know what's in them. 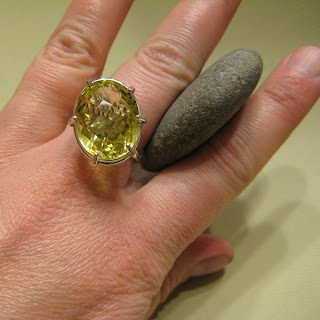 Well my citrine lot of checkerboard stones were not the medium ones I had hoped for, but were these huge ones!!! I decided that this would be a great opportunity to teach myself how to set a prong style ring. So I read up on it and this offset ring is the result of my study. Its very flashy, but it has the concrete hammered pattern on the band and is not as uniform as a stock jewelry store mold. wow that is georgous, I'm going to heart your shop right now. You make such beautiful jewelry. I'm not always too impressed with most Etsy jewelry shops but yours stands out above the rest. Amy, thanks for such a kind compliment! it is a beautiful and elegantly simple setting. I love the way the stone is purposefully off-angle. If that makes sense. That ring is gorgeous!!!! I love big flashy jewelry. Is this ring going to Etsy?